Home / Boarding at an independent school / Globalism: What do schools and the Armed Forces have in common? Globalism: What do schools and the Armed Forces have in common? Now here is a topic that can leave us worried about treading on eggshells. A debate about diversity can get rather heated, not least no doubt in the Armed Services. Boarding schools are also facing the opportunities and challenges that come from greater globalism, so it is interesting to compare the experiences of two traditional but evolving parts of British society. Boarding schools are becoming increasingly diverse in their mix of pupils. The Armed Forces themselves are actually part of the cause of this, as the numbers of ’Forces Kids‘ in the UK boarding community are falling, so schools have looked favourably at the growing international demand for a UK boarding school education. There are more than 27,000 non-British pupils whose parents live abroad, plus a further 17,000 foreign pupils whose parents live in the UK. In the former group, mainland China has now outpaced Hong Kong as the biggest source of international boarders in UK schools, followed by Russia, European countries and Nigeria. Data on the Armed Forces is a little harder to come by, but according to the answer to a Freedom of Information request, by 2012 there were over 12,000 soldiers from overseas in the British Army, or around 12 per cent of total troops at the time. Significant among these numbers were the Gurkha brigade, which at the time numbered around 3,700, and around 2,000 soldiers from Fiji. The total numbers had increased considerably, from just 600 in the mid-90s. In my business career before entering teaching, I was involved in a project that tried to increase the number of new recruits into the Armed Forces. Recruiting the most able from around the world was a natural solution, and there is an obvious similarity to UK boarding schools. The ‘Be the Best’ concept isn’t just a strapline in an Army advert, but also the approach taken by many schools to attract talented pupils from around the world. I am not of course expecting the Armed Services to follow the pattern of independent schools in recruiting from China and Russia! There are naturally operational limits on how far the Armed Services want to globalise their manpower. 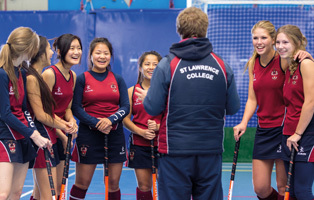 However, there are distinct advantages in recruiting from a wider pool in the experience of independent schools. In my own school we are privileged to have a number of Nepalese pupils because of our proximity to a Gurkha garrison, and they represent one of 26 different nationalities in the school. This diversity means my British pupils are prepared from a young age for the modern world of work, which is increasingly globalised; they have an appreciation of different cultures and languages, and how to work in teams across national barriers. It is also noticeable that many international pupils come from a culture where education is very highly esteemed, where high aspirations and work ethic have something to teach us in the UK. Anecdotally I can also understand why the Gurkhas have been such a fixed part of our Armed Services for so long, given the tenacious way their sons and daughters work hard in class and compete ferociously on the games pitch. The biggest challenge for schools when embracing the benefits of globalism is to foster integration. The key to this is ensuring a mix of pupils from different countries. It is always a good question to ask on a boarding school visit as a prospective parent, what the mix of students is per year group. In the past, some parents have asked this with a rather parochial perspective, wanting to be reassured that the boarding house is full of similar children from similar backgrounds. I sense something of a change now, with a greater awareness of the positive opportunities offered by a more diverse international community of boarders, as long as no one country dominates. In my opinion, a school that is positive about the virtues of globalism but careful about its nationality make up and takes integration seriously offers the best mix. When I look around my school, national and ethnic boundaries are very fluid: the Gurkha children are British (with thanks to Joanna Lumley! ), many Nigerian children have dual nationality and live as often in London as in Lagos, while some children with Polish parents have only ever known a British education. I believe that this environment is the best preparation for the future, for a world where national barriers become ever more fluid, and where required skills will involve creating and working in teams from an ever more diverse pool of workers. A healthy dose of cross-cultural understanding will certainly help this. Furthermore, I would suggest that the academic education of a more diverse community is inherently better than that from a monoculture. I was recently chatting to two pupils, one Ukrainian and the other Russian, about events in Crimea and Eastern Ukraine. Needless to say, the breadth of perspective available to other pupils in the ensuing debate went well beyond what one would find in a textbook! Overall then, what do schools and the Armed Forces have in common? They are both cherished institutions which have played a distinguished part in British history. They are widely regarded as leading the way internationally in their quality, and are a source of national pride in the way they represent the best of British values to the world. They are also in a state of flux, adapting to a changing global environment and different demands for their services. They will, I’m sure, continue to be beacons of best practice well into the future, their future success determined in part by their success in harnessing diversity towards the goal of excellence. 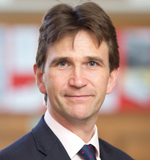 Antony Spencer has been Principal of St Lawrence College since 2013. Before this he was Academic Deputy at Clifton College in Bristol. After graduating from Oxford with a degree in Philosophy, Politics and Economics he very nearly entered the Army, with an offer to go to Sandhurst. Instead he worked in finance for a number of years before entering teaching. He is married to Suzanne, also a teacher, and their three youngest children all attend St Lawrence College.